The Missive Maven: Happy Hanu-Kat! 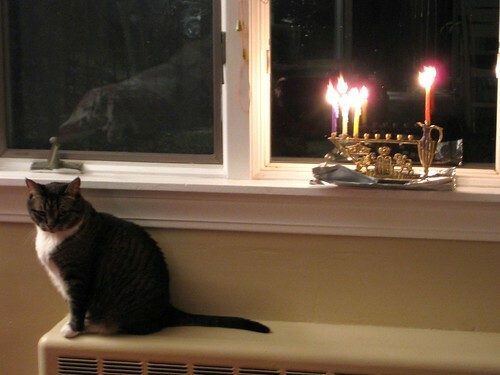 My very shy tabby cat Magic would like to join me in wishing a Happy Hanukkah to all my Jewish blog readers. Our menorah is popular with all three cats - they stare at the flickering candles with odd expressions. Soda has learned the hard way that getting too close to candles results in burned whiskers, but Magic has always kept a wiser distance. Happy Chanukah to you too. :) My roommate and I have been trying not to forget to light the candles, but it's hard when we have so many other things going on. Stephanie - me too! We've only been able to light candles two nights so far. I'm not Jewish, except for when it comes to eating latkes. My late cat Mousey would always get too close to the candle flame so her eyebrows would be wonky from the heat. Nice to see a pic of your cat too! I hope your Hannukah was a good one. I have yet to distribute gifts to my kids--December got too busy and the older wasn't home from college yet.